Here is a message I sent to the writer of this article about bats. Your article on bats unfortunately promotes disrespect for other species and the perceived human right to kill whatever is different from us and whatever threatens us in any small way. I do not find bats ugly or repulsive and I do not feel threatened by bats. (Imagine what they think of us really strange humans who are out to kill them.) 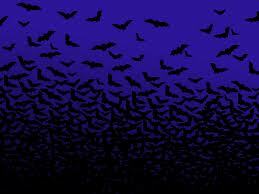 Many nights in the summer, we enjoy watching the bats over our backyard. Your article seems to imply that we should kill every bat that we encounter — because 2.5% of them have rabies? And how many of those rabid bats ever bite a human? Dogs and cats should be vaccinated against rabies. Just how big is this threat that we must respond to by killing pre-emptively? I would rather live and let live and worry about rabies in the extremely rare case that I get bit. I wish that more public writing would promote respect for life instead of human control over all species and the solving of perceived problems by killing. We diminish ourselves morally when we, lacking respect for other animals, assume superiority and control over other them and kill them unnecessarily. Thanks for thinking about these things. All bats are rabid and they all want to bite us | One Shared Planet.